Victoria's interactive media experience: Alice - What are you wearing? 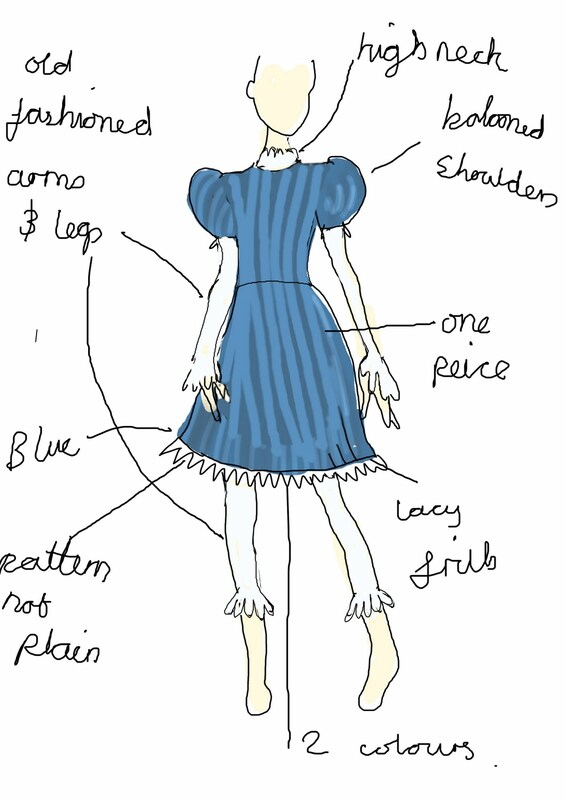 After looking at the the text in the book I realised thatthere was no information on alices costume, this made it hard for me as part of the brief was to design characters based on other peoples ideas and I had nothing to start with. The book didnt give much information about the characters appearence apart from the fact that she was 3 inches tall (the same size as the caterpillar and the mushroom)and had a curious personality. 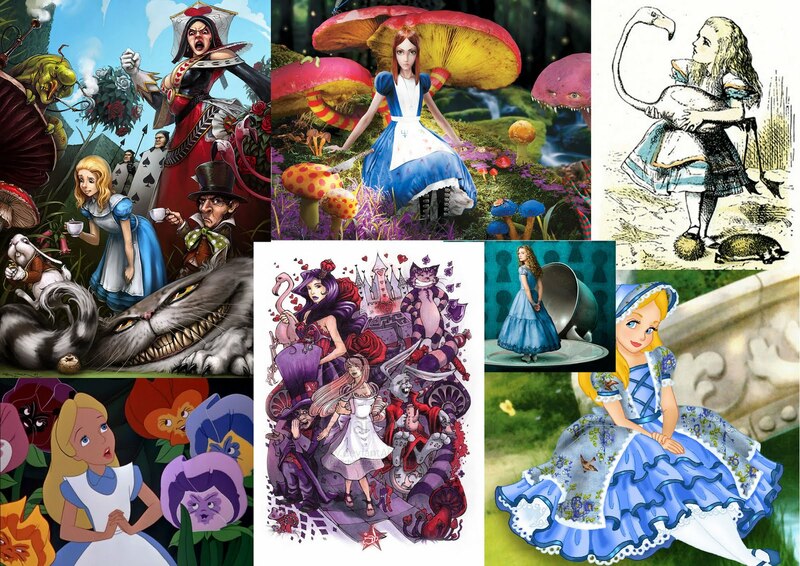 so I decided to look at others representation of the Alice and make a moodboard. I found some examples of others representation of Alice characters and was particularly interested in why she was nearly always wearing the blue dress as there was no reference to this in the book. I decided to do some research into why this was the case. 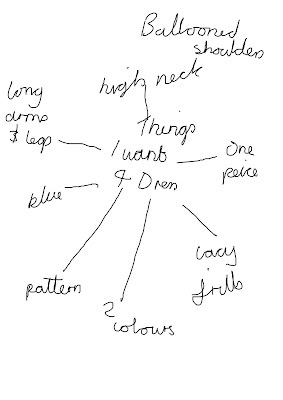 I found an extract online about why alice wore the blue dress. 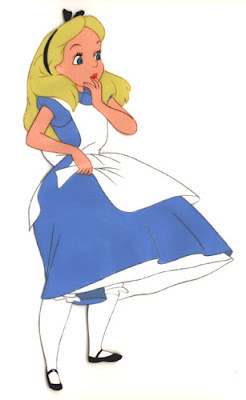 As Alice was first drawn in black and white her colours would vary from artist to artist; however, in the early coloured works by John Tenniel, her dress was blue, her white pinafore outlined in red, and she was blonde. 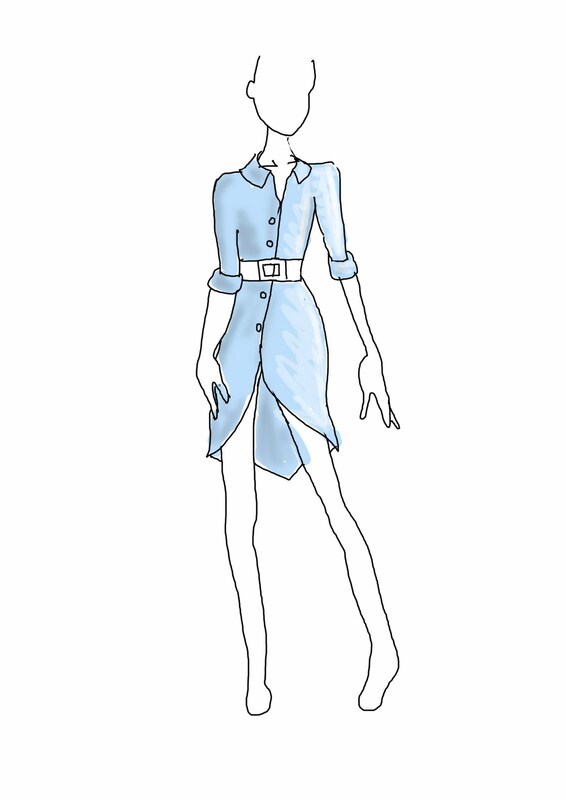 This look has, perhaps, become the classic and most widely recognized Alice in Wonderland dress in later works, notably Disney's. Tenniel drew Alice in two variants: for Through the Looking-Glass her pinafore is more ruffled and she is shown in striped stockings, an image which has remained in much of the later art. This is probably the most classic "Alice character" and the blue dress has originated from the disney animation. The article has lead me to believe that the blue dress has become alice's most recogniseable feature. 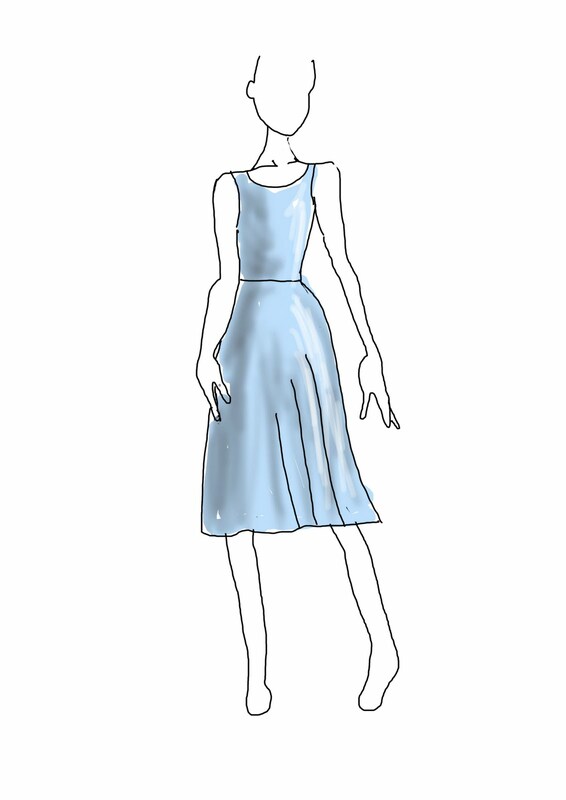 I think that not using a blue dress for my character would make Alice loose her identity and make her unrecogniseable to people. 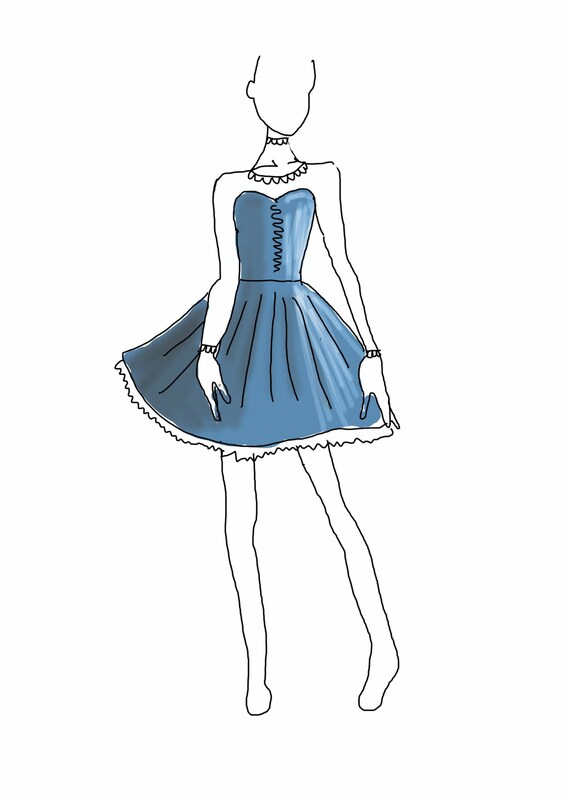 I have decided that the best way to communicate the "alice" character so that she is recognizable will be to make her wear a blue dress. More importantly as my target audience was teenagers and adults i thought it was likely that they would already have an idea of "alice in wonderland, alice" in there heads, so changing her apperaence may confuse them. 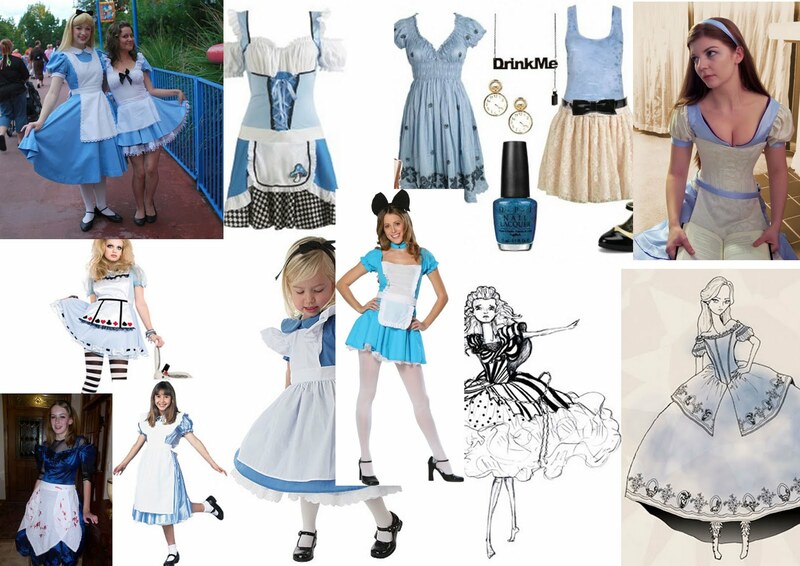 I decided to look at some examples of different types of "the dress" to help me start designing Alice's costume.I made a moodboard using the imagery that I found. 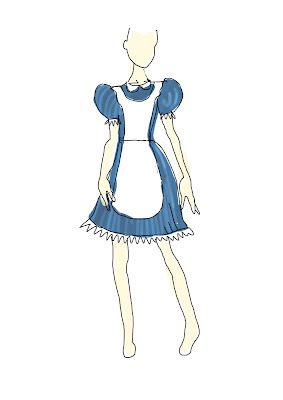 I particularaly liked the classic old fashioned alice dress as i felt this would communicate her character visually. 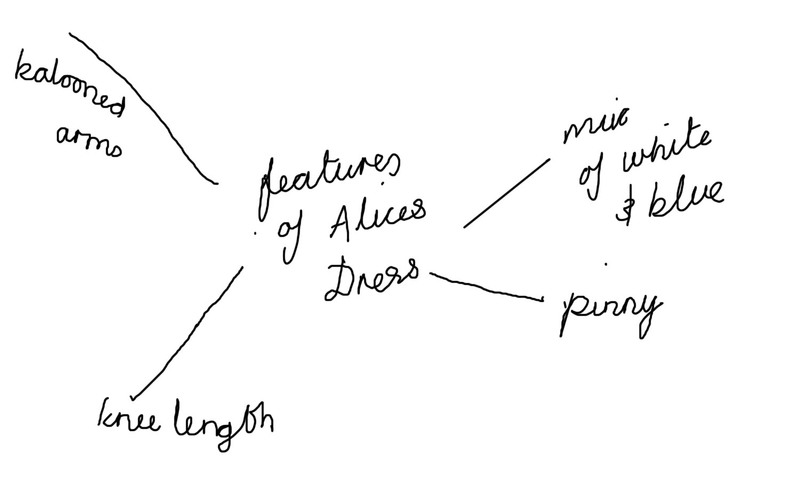 I decide to make a mind map of the features that made the examples a classic "alice dress". based on this moodboard I designed some dresses for alice, all of them were blue but I altered the design, I wanted to see what kind of designs would be appropriate for her character so that she would be recognized as "alice"
I experimented with a more modern style, I felt this was a little too modern and may make the character unrecognizable as alice. 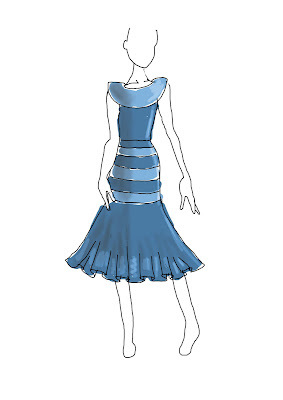 This style is a more traditional dress, This type of dress has similar features to the traditional alice dress and I feel it would make her character recognizable as alice.I thought the high neck line was appropriate for her character because it seemed wuite old fashioned. 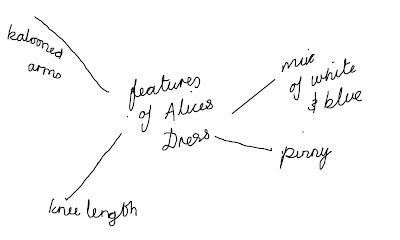 The style of this dress may be a bit grown up for alice, although I wanted to make alice appear a little older than the girl aged 7 she was meant to be i feel this would be too much of a jump between a costume for a young girl and that of a women. It wouldnt help communicate her character. This excample was a random experiment, the look is way too modern and it would never be suitable for the character, because it has no similaritys to the classic dress. 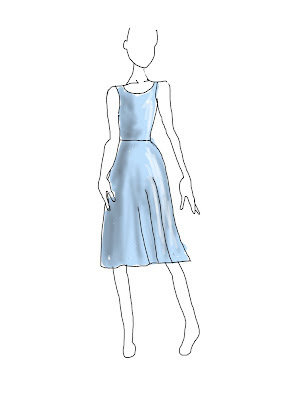 To use this dress would not communicate the character well as it would make the character loose her identity.I do however like the idea of giving the character long sleeves and shorts underneath her dress, ias i feel this will make it old fashioned allowing me to modernise other features of the dress. This design on reflection looks a bit like a sailors dress and would not be suitable for my characters costume. 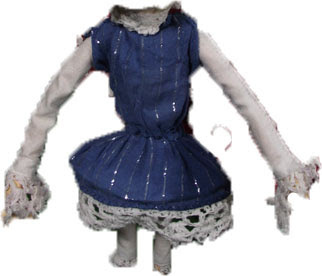 I really like this style of dress but I feel its a little too showy and grown up for my character.I do like the way in which it ballons out, and how it has frills.It would not suit her so i wont be using this design. 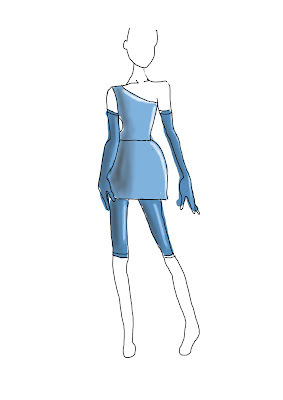 This design is a bit plain and uninteresting because it lacks detail.I wont be using it for alices costume.I do like the way it is in one peice though. 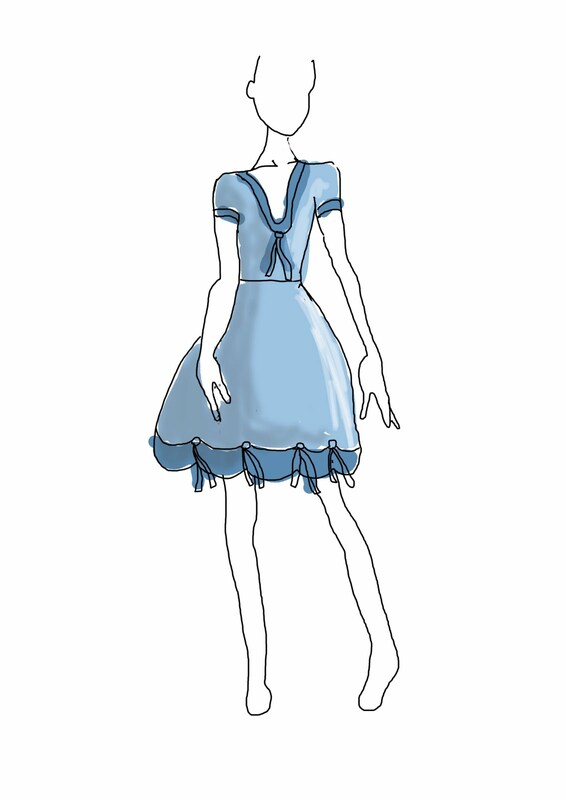 I have decided to base alices costume on this dress because although it is not the exact same style as the traditional alice in wonderland dress that is depicted in disney's animation, It still has all of the basic features that make it "alices" dress. Such as colour length, balloned arms and the pinny. i will make use of both of the colours. I made a mind map on all of the things i wanted to include based on the things i liked for my designs and what i felt was appropriate for alices character. 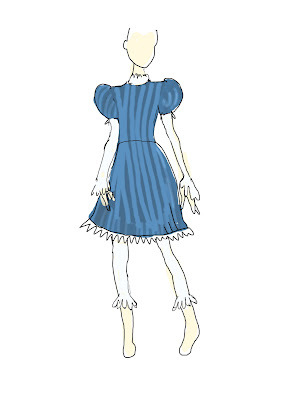 here is my final design for alices costume, based on my experiments. 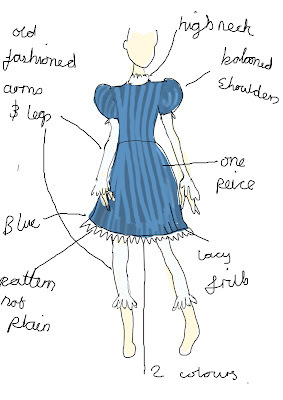 I think this design has all of the features that make it an alice dress and will communicater her character well. 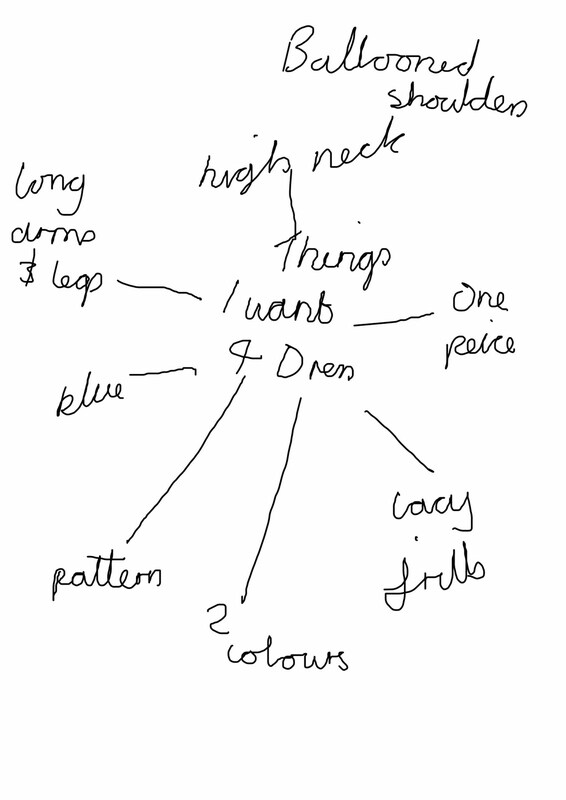 As you can see all of the decisions i have made from my experiments have benn included in her design. 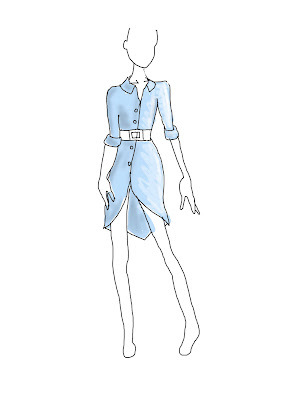 I then went on to make the dress from material, the sleeves and shorts where seperate.